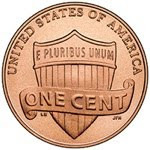 The U.S. Mint has redesigned the penny, a coin destined to go away if someone would just make a decision. It costs more to mint pennies and nickels than they're worth. While we're not talking about a lot of money compared to the rest of government spending, it seems like it's time for the penny to retire. Back in the 80's I was stationed in England. Rather than bother with pennies, they were taken out of circulation and all prices on the bases were rounded to the nearest nickel. I thought it worked very well.